The Chorus tells us the plot of the play, and what kind of play it is. Sampson and Gregory, servants of the house of Capulet, go out looking for trouble. . . . Sampson and Gregory almost pick a fight with Abraham and Balthasar, servants of the house of Montague. . . . Seeing a Capulet kinsman, Sampson and Gregory start to fight with Abraham and Balthasar. 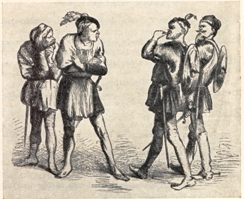 Benvolio tries to stop the fight, but Tybalt enters and attacks Benvolio. The citizens of Verona attack both the Capulets and Montagues. Capulet and Montague try to join the fight, but are restrained by their wives. . . . Prince Escalus stops the riot, threatens everyone with death, and takes Capulet with him, leaving Benvolio alone with Montague and Lady Montague. Lady Montague asks where Romeo is, and Benvolio answers that he was up before dawn, wandering in the woods. The Montagues say that Romeo is afflicted with strange sorrows, and Benvolio offers to find out what's wrong with him. . . . Seeing Romeo coming, Montague and Lady Montague leave Benvolio alone to speak with their son. Benvolio soon discovers that Romeo's problem is that he loves a woman who doesn't return his love. Benvolio tries to get Romeo to say who it is he loves, but Romeo won't. Benvolio also tries to get Romeo to solve his own problem by looking for another woman, but Romeo seems determined to love and suffer. Paris asks Capulet for Juliet's hand in marriage. Capulet thinks his daughter is too young, but tells Paris to woo her anyway, and invites him to a feast that night. Capulet sends the servant out to invite other guests to the feast. . . . Benvolio is still trying to talk Romeo into considering other ladies when they are interrupted by the Capulet servant, who asks Romeo to read something for him. It is a list of guests at Capulet's feast that night. Thus Romeo discovers that Rosaline, his beloved, will be at the feast. Benvolio challenges Romeo to go to the feast and compare Rosaline with other beauties. Romeo says he will go, but only to rejoice that Rosaline is most beautiful of all. the Nurse interrupts with a long reminiscence about Juliet's weaning and what toddler Juliet said about falling on her back. Lady Capulet tells Juliet that Paris wants to marry her, and urges her to look him over and see that he is the husband for her. Servants come to call everyone to the feast. Mercutio tries to persuade Romeo to dance at Capulet's feast, but Romeo insists that he is too sadly love-lorn to do anything but hold a torch. Then Romeo says that it's not wise to go to the feast at all, because of a dream he had. . . . Mercutio mocks Romeo's belief in his dream by going on and on about "Queen Mab," but Romeo is sure that some terrible fate awaits him. Nevertheless, he goes into the feast with his friends. At Capulet's house, Romeo and his friends enter as preparations are being made for the dancing. The musicians are tuning up, and the servants are hurrying to clear away the remains of the feast. . . . Capulet enters, greets the masked strangers, and invites them to dance. Romeo sees Juliet and says to himself that this is the first time he's seen true beauty. Tybalt recognizes Romeo and sends for his sword, but Capulet orders Tybalt to do nothing. Saying that he'll make Romeo pay, Tybalt leaves. . . . Romeo holds Juliet's hand, and begs a kiss, which she gives him. They kiss again, and then both are called away. As everyone is leaving, they each learn the name of the other, and they each exclaim upon the fate that has made each fall in love with his/her enemy. On his way home from Capulet's feast, Romeo turns back and jumps the wall of Capulet's garden. Benvolio calls for Romeo and then Mercutio bawdily conjures Romeo to appear, but he does not come out of hiding, and his friends depart. In Capulet's garden Romeo sees Juliet come to her window. He is entranced by her beauty and listens as she tells the night that she loves Romeo and wishes that he had another name. Romeo surprises her by offering to take another name for her love. At first, Juliet worries for Romeo's safety and then she worries that he may be a deceiver, but he wins her over with passionate vows of love. They pledge their love to one another and then Juliet is called away by the Nurse. . . . Answering the call of the Nurse, Juliet goes into the house, then comes right back out and tells Romeo that the next day she will send a messenger to find out when and where she is to meet and marry him. 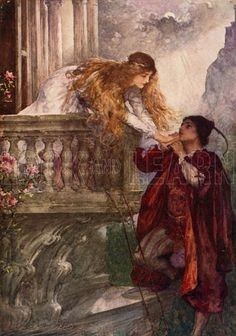 Juliet is again called back into the house, and Romeo starts to leave, but Juliet again comes back out, to set a time that her messenger should go to Romeo. Romeo tells her that the messenger should come at nine in the morning. They say a long goodbye, and after Juliet is gone, Romeo says that he will go to the cell of Friar Laurence to get his help. At dawn Friar Laurence gathers herbs and comments on howin both plants and peopleeverything has some good, but every good can be abused and turned to evil. . . . Romeo appears and tells Friar Laurence that he has fallen in love with Juliet and wants the friar to marry them. 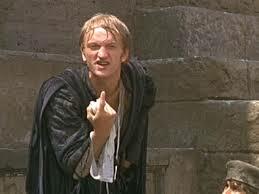 Friar Laurence criticizes Romeo for jumping so quickly from the love of Rosaline to the love of Juliet, but agrees to perform the ceremony because he thinks that the marriage may end the hatred between Juliet's family, the Capulets, and Romeo's family, the Montagues. Mercutio wonders where Romeo is. Benvolio says that Tybalt has sent a challenge to Romeo, and Mercutio scornfully describes Tybalt as a conceited killer. . . . Mercutio kids Romeo about love, and Romeo joins in the bawdy repartee. . . . Mercutio bawdily mocks the Nurse, who tells Romeo that she wants a word in private with him. . . . The Nurse complains about Mercutio, receives from Romeo the information about time and place of the wedding, then chatters on about how sweet Juliet is. Juliet impatiently awaits the return of the Nurse with news from Romeo. . . . The Nurse teases Juliet by finding all kinds of ways to not deliver the joyful news, but finally tells her that she is to go Friar Laurence's cell to be married to Romeo. Just before the wedding, Friar Laurence advises Romeo to love moderately. . . . Romeo and Juliet tell each other how much they love one another, and Friar Laurence leads them off to be married. On the streets of Verona Benvolio tries to persuade Mercutio that it's best to stay out of the way of the Capulets and a quarrel, but Mercutio jokingly claims that Benvolio is as much of a quarreler as anyone. . . . Tybalt, looking for Romeo, is challenged to a fight by Mercutio, but then Romeo appears. . . . Tybalt challenges Romeo to fight. Romeo refuses, but Mercutio steps forward and fights Tybalt. As Romeo is trying to stop the fight, Tybalt gives Mercutio a wound, then runs away. Mercutio dies. Romeo is ashamed of himself for letting Mercutio do the fighting, and when Tybalt returns, Romeo kills him. Benvolio has a hard time getting the dazed Romeo to leave the scene. . . . Benvolio tells the Prince what happened. Lady Capulet wants Romeo's life, but the Prince levies fines and exiles Romeo. Juliet longs for the coming of night and Romeo. . . . The Nurse appears; she has seen Tybalt's corpse and heard that Romeo has been banished. The Nurse is so overwrought that her words first make Juliet think that Romeo is dead. When the Nurse finally makes it clear that Tybalt is dead and Romeo is banished, Juliet first turns against Romeo for killing her cousin, then defends him for killing the man who would have killed him. 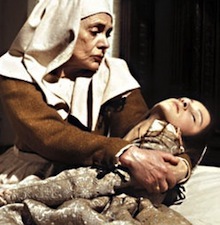 Then Juliet remembers that the Nurse said Romeo has been "banished," which drives her to despair. The Nurse promises Juliet that she'll make arrangements for Romeo to come that night for a farewell visit. Learning from the Friar that he is to be banished, Romeo declares that the Friar is torturing him to death, then throws himself on the floor, moaning and weeping. . . . The Nurse brings news that Juliet is in just as bad shape as Romeo. Romeo, wild with guilt at the pain he has caused Juliet, tries to stab himself. Friar Laurence lectures Romeo and tells him what to dogo to Juliet, then on to Mantua until the Prince can be persuaded to pardon him. The Nurse gives Romeo the ring that Juliet asked her to take to him. These things put Romeo into a better frame of mind and he leaves Friar Laurence's cell to go to Juliet. On a sudden impulse, Capulet promises Paris that Juliet will marry him the day after tomorrow. Just before dawn Romeo is preparing to leave, but Juliet declares that it's still night, so he can stay. Romeo offers to stay and die, but Juliet urges him to leave. . . . The Nurse hurries in with the news that Juliet's mother is coming. Romeo kisses Juliet and leaps out the window. Juliet asks if they will ever see each other again; Romeo is sure they will, but Juliet is full of foreboding. . . . Lady Capulet, assuming that Juliet is weeping for Tybalt, tells her that she's grieving too much, then decides that Juliet must be weeping because revenge has not been taken upon Romeo. Lady Capulet expresses her hatred of Romeo and Juliet appears to agree with her, though what she really means is that she loves Romeo. Lady Capulet then delivers news which she thinks ought to cheer up Julietshe is to be married to Paris. Juliet refuses. Lady Capulet replies that Juliet's father is coming, so Juliet ought to tell him that she won't marry Paris, if she dares. . . . But then Lady Capulet herself tells her husband Juliet has refused to marry Paris. Enraged, Capulet threatens to throw his daughter out of the house if she doesn't change her mind. Juliet pleads with her mother to intervene, but Lady Capulet refuses. . . . Juliet asks the Nurse for advice, and she tells Juliet that she ought to marry Paris because Romeo can never come back and Paris is better looking, anyway. Juliet pretends to accept the Nurse's advice but decides that she will go to Friar Laurence for his advice. If he can't help her, she will kill herself. As Paris is making arrangements with Friar Laurence to perform the wedding ceremony between himself and Juliet, she appears. Paris tries to tease some sign of affection out of Juliet and reminds her that they are to be married on Thursday. . . . Juliet tells Friar Laurence she will kill herself rather than marry Paris, and the friar comes up with the plan to take the drug which will make her appear dead for 42 hours, so that the wedding will be called off and Romeo can come and take her to Mantua. Capulet is making arrangements for the wedding feast when Juliet appears, begs her father's pardon, and tells him that she will marry Paris. This makes Capulet so happy that he moves the wedding up to the very next day, Wednesday. Juliet persuades her mother and the Nurse to leave her alone. She agonizes over everything that could go wrong, is terrified by visions of the grave, and drinks to Romeo. The Capulets and their servants are busily preparing for the wedding. Paris' musicians are heard, and Capulet sends the Nurse to awaken Juliet. The Nurse tries to awaken Juliet, but finds that she is (apparently) dead. Lady Capulet and Capulet come running, then lament their daughter's death. . . . The rest of the wedding party arrives, only to find that Juliet is dead and hear the clamor of lamentation. Capulet, Lady Capulet, Paris, and the Nurse go nearly wild with grief, but Friar Laurence takes command of the situation by reminding everyone that Juliet is now in a better place, and telling them to proceed with her funeral. . . . As the musicians are starting to leave, Peter rushes in and demands that they play a sad song to cheer him up. They refuse, Peter insults them with a riddle, and they all leave to wait for lunch. Romeo expects good news from Verona, but receives the news that Juliet is dead. He buys poison of an apothocary and says that he intends to return to Verona and join Juliet in death. Friar John explains to Friar Laurence why he was unable to deliver Friar Laurence's letter to Romeo. Friar Laurence sends Friar John to get a crowbar and makes plans to be there when Juliet awakes, to write again to Romeo in Mantua, and to hide Juliet in his cell until Romeo arrives. Paris comes to Juliet's grave to strew flowers and weep, so he sends his Page a little ways off, to act as a look-out. Paris promises Juliet to visit her grave every night, then the Page whistles to warn him that someone is coming. Paris sees a torch and withdraws into the darkness to see who else has come to Juliet's grave. . . . At the tomb's entrance, Romeo sends Balthasar away with a letter for Romeo's father, and then starts to open the tomb. Paris comes forward and tries to arrest Romeo. They fight, and Romeo kills Paris. 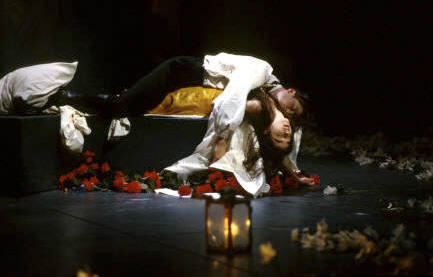 As he is dying, Paris asks to be laid next to Juliet. Romeo does this, pledges his love to Juliet, takes the poison, and dies. . . . Friar Laurence comes and finds Romeo and Paris dead. Juliet awakes and Friar Laurence tries to persuade her to come out of the tomb, but being afraid of being found there by the watchmen, he runs away. Juliet kills herself with Romeo's dagger. Paris' page takes the watchmen to the Capulet monument where watchmen find Balthasar and Friar Laurence. Prince Escalus arrives, then Capulet, Lady Capulet, and Montague. Friar Laurence tells his story, which is confirmed by Balthasar, Paris' page, and the letter from Romeo to his father. Montague [Romeo's father] promises to build a golden statue of Juliet, and Capulet [Juliet's father] promises to build one of Romeo.